metal trash can concealed by fabric. the most of every inch of space. Visit Jen from Our Daily Big Top and congratulate her on WINNING THE $100 DAYSPRING GIFT CERTIFICATE for products from the Life Collection! Happy Mother’s Day Jen! Thanks to EVERYONE who entered! Be sure to use your DaySpring discount code Life20 to shop for yourself! What a genius storage & nightstand solution indeed! How clever. I would of never thought to use a metal trash can. I have a laptop cart that is hideous looking…I need to do something like this to dress it up…thanks for the idea! Stacey @ The Blessed Nests inspiring blog post..Creating a Welcoming Home for Spring! Fabulous! I love creative storage ideas. I might have to try this out sometime soon. We’ve done this for years & love it. No one ever knows. tables that are always crooked or getting knocked over by the cats and dogs. Yes, my mother has been using old drums for this purpose and covering them with a tablecloth. I think the fabric makes all the difference AND the use of an actual table top of glass or wood as this one shows AND a container the correct height. Wonderful solution for those out-of-season clothes! I have a metal trash can with Elmo painted on the sides. The kids are over Elmo but this would be a great use for it! Angie @ The Creative Mamas inspiring blog post..Shabby Chic – distress for less. I love that idea! Of course that the picture shows red, black and yellow even makes me love it more! Wow! Thank you so much. The 20 happy things post was just what I needed to read and write about this week. Genius! I love this idea, now if I could only remember where I stash my out of season items. That’s the tricky part! Oh, I love love love this idea! I’m wondering if you could use rectangular tubs or even tall laundry baskets if you were gonna put blankets in there… hhmmm… Thanks! Julies inspiring blog post..Well, I’m still here! Where do you get the wooden top? Would one of those tables with the screw-in legs work? You could use the top from one of those particle board tables! Those are useless underneath, I am loving the idea of the storage instead of those wobbly criss crossed panels underneath. I think you can also have a board cut just for this purpose. As an owner of a small home, who knows the importance of making everything functional, I think this is a FABULOUS idea!! Thanks for sharing! You are welcome, I am absolutely going to do this in our guest room because I never know where to put the SLEEPING BAGS! They take up too much room in a closet. Now I know where to put them! 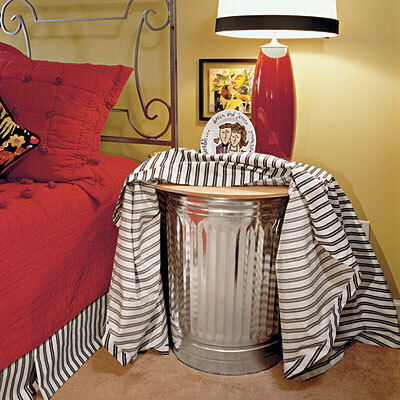 Wow, I think Oscar the Grouch would love this innovative new idea for a bedside storage table! You think? Well, now that’s creative! I’m going to try to remember that for the future. I typed my address wrong above.